Energean Oil and Gas announced that first steel was cut on the Karish and Tanin floating production storage and offloading (FPSO) vessel at the COSCO yard in Zhoushan, China, on Monday. The FPSO is scheduled to be delivered to the Karish field offshore Israel in late 2020, ahead of first production in the first quarter of 2021. The FPSO, which will be installed 90 kilometers offshore, will be the first FPSO to operate in the Eastern Mediterranean. It will have a gas treatment capacity of 800 MMscf/day (8 BCM/per annum) and liquids storage capacity of 800,000 bbls. 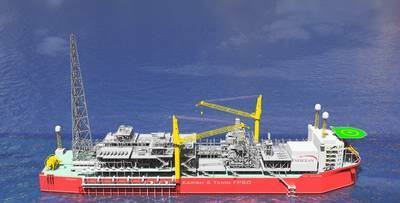 Energean, an E&P company with operations offshore Israel, Greece and the Adriatic, has contracted TechnipFMC under a turnkey, lump sum EPCIC contract to deliver the FPSO and SURF for the development of the Karish & Tanin project with first gas planned for Q1 2021. Energean is planning to spud in March 2019 Karish North, the first of four wells planned to be drilled in Israel during 2019. Karish North is targeting 1.3 TCF of prospective resources with a very high chance of success over and above the 2.4Tcf 2P reserves in Karish-Tanin. Energean has already signed firm contracts for 4.2 bcma of gas sales into the Israeli domestic market. Future gas sales agreements will focus on both the growing Israeli domestic market and key export markets in the region. Energean Israel owns 100 percent and is the operator of the Karish and Tanin leases, offshore Israel. The fields have 2.2 TCF of natural gas and 31.8 million barrels of light hydrocarbon liquids independently audited 2P reserves plus 5.4 BCM of gas and 1.0 mmbls of liquids 2C resources. NSAI has audited 2.94 TCF of gas plus 78.8 mmbls of liquids unrisked prospective resources. Energean made Final Investment Decision for the development project in March 2018, after having signed 12 Gas Sales and Purchase Agreements for 4,2 BCM in total annually and secured financing for the project. The Karish main field will be the first asset to be developed in the Karish and Tanin blocks. Karish is the largest discovery, is expected to provide the highest yield of liquid per volume of produced gas and is the closest discovery to shore. Capex for the Karish development (First Phase) is estimated at $1.6 billion.